Ok, I’m three cups of coffee, one cup of tea, a load of sweets and a two hour power nap in. I can do this. This morning (or last night depending on your view of the world), I woke up at 4:10am to take part in the 198 mile Round Norfolk Relay for my awesome running club Ely Runners. For the uninitiated (as I was prior to my taking part in it) the RNR is a 17 stage mega relay that goes – yep, you guessed it – right the way round Norfolk, starting and ending at King’s Lynn. I was given stage 14, which is thankfully one of the shorter legs at 7.27 miles and goes from Feltwell to Wissington, and my faithful running buddy Pete took on the 10.59 mile stage 15 from Wissington to Downham Market, which meant that we could travel to the start together. The thing with the RNR is that the organisation behind it is frankly insane. Our team of 5 must have worked their socks off working out everyone’s estimated start time based on the pace each runner thought they would run their leg in. And it’s so hard to know exactly how you’ll do on the day. if you end up being a bit slower than expected it’s not a disaster as the runner you’re handing the baton to should be there ready and waiting. 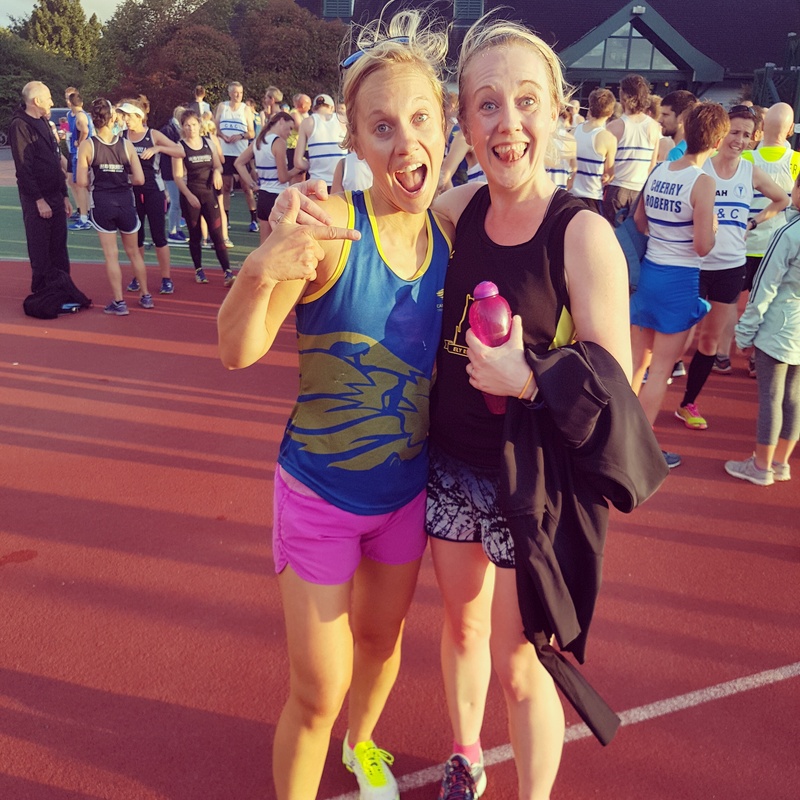 However, if you run a blinder (as some of our runners did) and shave some time off, there’s a risk your runner might not be there waiting for you. It’s high stress stuff for those on the support crew, trying to make sure everything runs smoothly. So at 4:15am, as I was putting my contact lenses in, I got a message saying my leg would be due to start no later than 5:30am. My previous start time had been 6:08am. And Pete and I had planned to be there 40 minutes in advance. So cue a somewhat, um, “energetic” rush round the house. Pete got to me at 4:48am, 12 minutes earlier than we’d originally planned, and we crossed our fingers and set off. Now we hadn’t planned for mega thick fog, which scuppered all chances of putting our foot down, and messages between us and the support crew were intermittent at best due to the ropey Fenland signal. And then we got to a mist-filled Feltwell it looked more like something out of a horror movie than a place where a hundred or so runners and crew would be gathered. Thankfully Pete had been organised and knew where in Feltwell we needed to be, so we finally parked up at around 5:25am, panicking ever so slightly that I needed to be kitted up and raring to go in 5 minutes. But as it turned out, the cheeky little sausages on the support team had been erring on the side of caution due to the previous runner arriving late for their handover, so in order to be sure I’d be there in time they’d told me to be there a tad earlier than necessary. I may not have been overly impressed as I stood in the freezing fog, but with hindsight it gave me bags of time to prepare myself, get hydrated, use the portaloo (3 times -standard) and grab the baton from John at a couple of minutes to 6:00am. The fog was still super thick but it wasn’t too cold out once I got moving. It was also just starting to lighten up when I set off. It was a weird experience. I haven’t run for a while because of a grumpy foot (suspected tendonitis) and I am SO not a morning person. So the entire run seemed to pass super quickly in a bit of a blur, and I really didn’t take much in. I think I just went on autopilot. The sun came up when I was running but the fog was so thick I could barely see more than a few metres ahead of me. And it’s such a weird sensation to hear cars crawling along just a few metres behind you (every nighttime runner needs a support vehicle driving behind them). The Ely Runners crew (we were on the club’s B team) were just awesome, checking I was ok, and the human megaphone James knew me well enough to know that I’d respond well to some banter (by that I mean giving him the finger when he told me to hurry up). And before I knew it, I was being told I was 500 yards away but a cycling marshal (I resisted to urge to ask him how far that actually flipping meant as I haven’t a scoobie about yards) and then I was passing the baton to Pete, who had driven to his start point with Andy from the support crew. After a few minutes to gather myself and to crow over the frankly RIDICULOUS medal Andy gave to me, we then hopped in the car and drove towards Downham Market to meet Pete, honking the horn and whooping at him as we overtook him a mile or so down the road. The organisation that goes behind the RNR, both by the support crews and the overall organisers is unreal. This was its 31st year, and they had over 1000 runners taking part. They had marshals positioned 500 metres or so from the start of each checkpoint, who would shout team numbers over their walkie talkies to their colleagues waiting at the check point so that they could make sure the next runner was ready to go (provided they had turned up on time – apparently the chap in front of me had no one waiting for him at Wissington). On paper it looks like an absolute nightmare, but from my point of view it was seamless. The support crew even turned up with a coffee for me as I waited for Pete arrive in Downham Market (the van had switched to cycle support by then). Pete roared in to Downham Market at around 8:07am, and handed over to Anne who was running the penultimate leg. We also managed to catch up with some members of the A team, who had made up enough time to overtake the B team during stage 16 (the idea is faster teams start later so every team taking part finishes in around a 45 minute window from 10:15am – 11am). Pete and I then hopped in to the car to drive the 25 minutes home (the beauty of our stage of the race is that it’s the closest part of Norfolk to Ely) and at 9:30am went to Arbuckle’s with Rachel, her and Pete’s daughter Ellie and somewhat randomly my parents, niece and nephew. A great end to a great event. On paper the RNR seems wildly complex, and in some ways it really is. But it’s also SO well done, and it’s an incredible event to be part of. Some people are doing epic feats of endurance (some legs, including one that falls in the early hours, are 19 miles long) and the atmosphere is great. If you’re thinking of entering a team I can’t recommend it enough, if only to go home with a medal that doubles up as a cake plate. I really hope I’m lucky enough to take part again next year. Huge thanks to our organisers Sarah, Steve Caroline, Andy and James. We could not have done this without you depriving yourselves of sleep for 30+ hours, not to mention the hours of organising in the run up to the event. And after all this, I might even wear that flipping hoodie again! A couple of weeks ago, a mere 6 days after the behemoth (well, for me anyway) run that was the Wings for Life World Run, I found myself heading to the old army barracks at Waterbeach to take part in the 10km race that was being held as part of the inaugural Waterbeach Running Festival. The festival was being held in aid of the Waterbeach Toddler Playgroup, and when my friends Pete and Rach told me that they had signed up, I thought I may as well give it a bash myself. After the scorching heat of the previous weekend, it was a bit of a shock to the system when we arrived at the barracks to a leaden sky and temperatures that were seriously struggling to reach double figures, as well as a less than helpful wind. The barracks themselves are also a little spooky – a great setting for a horror film for any keen amateur film-makers out there. Despite this, the atmosphere was buzzy and everyone seemed genuinely excited to be the first to take part in a new addition to the Cambridgeshire running calendar. The festival itself was made up of four events – a 100m toddle for under 5s, a 2km fun run for ages 4+, a 5km run for ages 11+ and then the 10km for ages 15+. I have to say that when I found myself having a major internal battle regarding whether I should run in capris or shorts I did ask the others why we hadn’t signed up for the 5km. Sadly none of us had a sensible answer for that. After we had grabbed our race numbers (a flawless process), we then ventured outside to do a highly necessary warm up. I did feel a bit sorry for the vendors who had pitched up for the fair, including the awesome Sweet Ally Scoops, because the freezing cold weather meant that ice cream wasn’t high up on people’s snack agenda. I imagine that if the weather had been nicer the whole festival would have had an awesome party vibe. Once we’d warmed up we headed to the race start, which was about a 2 minute jog from the sports hall where we’d registered (not “miles away” as some worried looking folk were telling us as the start time edged ever nearer)! The race itself was a 2-lap course, set to start 15 minutes after the 5km runners had started. This meant that some of the faster 10km runners would find themselves catching up the 5km tail runners, but the path was so wide that this wouldn’t be an issue. There were around 100 runners taking part in the 10km, and after we had the usual housekeeping chat from the organisers, we were off. To be honest, if you’re looking for a picturesque race, then this isn’t the one for you. It’s pretty barren, and the layout of the course means you can often see the runners who are way ahead of you, which has the potential to mess with your mojo. Plus I know runners have mixed feeling about 2-lap courses. Personally I don’t mind them (10km is 10km however you look at it), but I get that it can be mentally tough to finish 5km only to think “bloody hell I have to do that again? !” But the positive thing about this race is that it is flat. There is the occasional pothole and the surface is ever so slightly gravelly, but the upshot is that this is a course with serious PB potential. When I started the race, I got ahead of the other handful of women at the start within about 100m. However, I regretted this pretty quickly as I started panicking that I had gone off too quickly and I had no idea just how close to me these women were. Were they just drafting behind me, waiting for the perfect moment to strike and zoom past me? At about 7km in, my left leg started to grumble a bit. After the 11 miles in high temperatures from the previous weekend, my legs didn’t really know what had hit them. As someone who averages 10-15 miles a week, after this run I would be at 24 miles in 7 days. That’s a pretty serious increase, and I started to wonder if my leg would hold up. At 8km I had no choice but to walk for about 10 seconds, which annoyed me immensely as I hate it when I don’t manage to run an entire race. On the plus side however, I managed to look over my shoulder and see that there was no other woman in sight. This gave me the mental boost I needed, and I dug deep and completed the race as the first woman, something I’m still in shock about. I completed the race in 43:55, which is not a time I’m particularly proud of (my PB being 42:41) but which I suppose wasn’t bad on tired legs. In even more exciting news, both Pete and Rach managed PBs, which considering the windy conditions was blooming awesome. Hopefully these results will put as all in good stead for the season, and put Pete on his way to finally achieving his sub 1:30 half marathon. Unfortunately my leg has been grumpy ever since the race. Every time I run, I feel good during the session but the next day it completely seizes up. It’s my own silly fault for upping my mileage so much, but I don’t think it’s muscular as a physio appointment and some epic foam rolling and stretching hasn’t eased it much. I’m seeing my fab osteopath Melissa at Spritely Osteopathy at an ungodly hour on Tuesday morning, so fingers crossed she’ll be able to pinpoint the root cause of the problem. Wish me luck. As far as the races goes, I can’t recommend the Waterbeach Running Festival enough. It was smoothly run, the organisers and marshals were friendly, encouraging and professional, and the course is ideal for anyone hoping to smash their 5km or 10km PB. Every runner gets a medal, and my trophy is so gorgeous. Fingers crossed this becomes an annual event, and that next year we get ice cream weather.